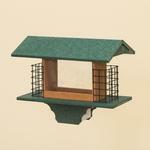 In the bird feeder world, more food options means more bird species. 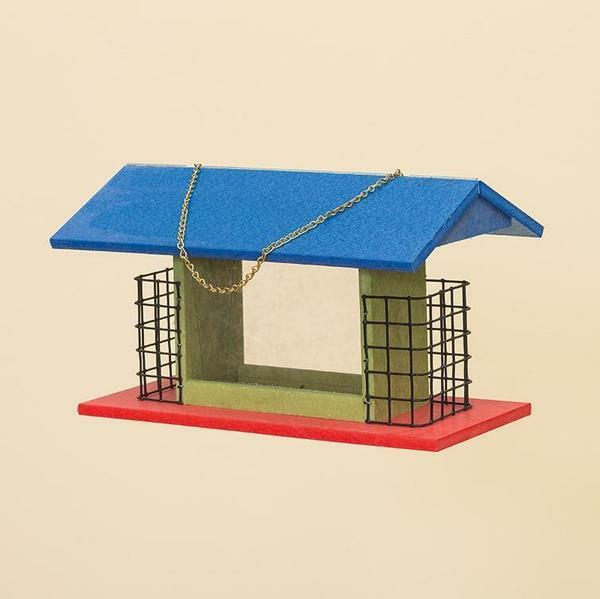 This Amish Rectangular Bird Feeder with Suet has all bases covered, with space for seeds in addition to cages for tasty varieties of suet ball or cakes. Mix and match to see what kinds of color could come to your garden this summer. 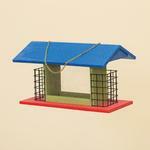 Additionally, the poly used in the creation of this Amish bird feeder is incredibly durable, so you'll get seasons upon seasons of use from this particular feeder. 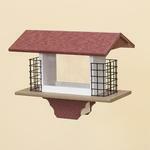 The flip up hinged roof makes this bird feeder easy to clean, and it can be mounted on a post or hung. True customization to fit your needs - that's the beauty of Amish craftsmanship. Optional Post and Planter Note: The post will be wooden either way, but if you choose the poly base, your post will be covered with a PVC sleeve to help protect it from the elements. Flowers will grow quite happily in the planter based, adding another decorative dimension to this piece.